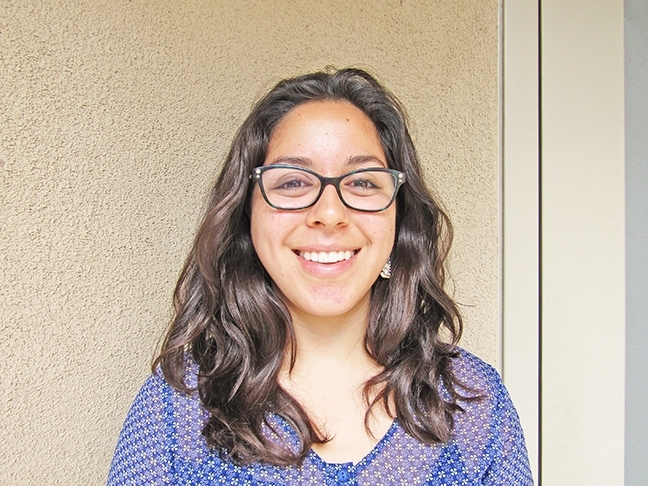 Natali Camacho remembers her college experience as a tough but important part of her life. She went to Allan Hancock College for three years and then transferred to UC Davis where she earned her degree in Wildlife, Fish, and Conservation Biology. She wasn't exactly thrilled to be attending community college because her first choice was a university. Family and financial circumstances ultimately put her on the community college path. At first, Camacho was crushed. "But it [community college] opened my eyes, because I realized I was not ready to go forward to a university because I wasn't taught the skills or know what to look for in a university," Camacho said. Natali Camacho is taking her experience in higher education and sharing it with Latina girls interested in pursuing a four-year degree. A lot of high school seniors readying themselves for college don't know the right questions to ask, such as how to utilize financial aid, where to look for scholarships, what will student debt look like after college, or where to find career workshops. These are questions that Camacho has learned the answers to through her experience in higher education, and it's knowledge that she uses as a regional coordinator for Peoples' Self-Help Housing through its educational support programs. Camacho teaches her students what questions to ask and what resources to look into. The support programs include College Club, Youth Education and Enhancement Program, Youth Literacy Program, The Working Neighborhoods Initiative, and Adult Literacy and Workforce Readiness Program. Camacho heads the newest program, College Enrollment for Latinas Entering Bright Rewarding Educations (CELEBRE). The program is still in its beginning stages, and it recently received a $25,000 grant from the Women's Legacy Fund. CELEBRE is an extension of College Club, a program that creates a supportive environment for students who are preparing for or are already in higher education. Full-time advisors work with students to build the skills and knowledge needed for that next step through workshops, assistance with admissions applications, and finding scholarships. CELEBRE does all that but focuses on supporting Latina girls and women. Camacho said this is an important program because these specific females may not otherwise have exposure to the option of continuing their education past high school. "These women in particular grow up in families where the mom is the caretaker and is mostly at home. There isn't a big example of what options are out there for them," she said. Men are expected to have these paying jobs–and for women, it's considered odd for them to choose a career over having a family at 19 or 21 years old. She said in 2011, 17 percent of Latina women aged 25 to 29 had received a bachelor's degree compared to 43 percent of Caucasian females and 23 percent of African-American females of the same age group. "I think because a lot of parents or immigrant parents like my own parents kind of have the mentality that I have seen from my own parents, which is, they came here and working is the key to surviving and to a better life," she said. "Tapping into education was never as available to them as they might have liked." She wants to make it clear that not pursuing higher education is not the family's fault, because most are working hard to make a living and raise their families. That's where Camacho comes in to talk about the numerous career options out there for females post college graduation. In the end, Camacho said, the parents she works with only want success for their children, just like her parents did for her. Camacho's mom received her bachelor's degree at the age of 40 while she raised three children and worked full time. Her dad recently started attending Hancock to take English courses. Her parents wanted more for Camacho, and getting her degree was the start of that. Aside from answering questions that Latina students may have about college or career options, Camacho said that many parents come along with questions of their own. They often wonder what they can do to support their child in finding resources for a successful path to a university or how to pay for higher education. What she has found is that many families are fearful of putting their child in debt. Camacho understands that getting a job after high school comes with immediate satisfaction when someone is getting paid every week or every other week. College is an investment that won't be seen for another four years or more. Student loan debt is something serious to think about, but Camacho tells the parents what her mom told her. "We get into debt with houses and cars, and we lose all that, but education, no one can ever take that away from you," she said. CELEBRE is currently supporting 14 girls and their parents. Camacho said seeing the trust she's built with these students and their families is daunting because she feels their lives are in her hands–but she wouldn't have it any other way. "My hand is here; come on, let's go through this together," she said. Sun sister paper New Times Staff Writer Karen Garcia can be reached at kgarcia@newtimesslo.com.